That the main results of the astronomer’s work are not so immediately practical does not detract from their value. They are, I venture to think, the more to be prized on that account. 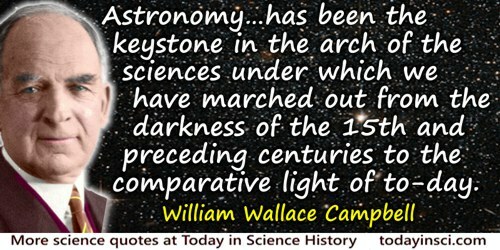 Astronomy has profoundly influenced the thought of the race. In fact, it has been the keystone in the arch of the sciences under which we have marched out from the darkness of the fifteenth and preceding centuries to the comparative light of to-day.